The hog-nosed snakes are one of several groups of snakes that have transformed the edge of their upper jaw into hardened ridges that meet in an upturned crest at the tip of the snout. 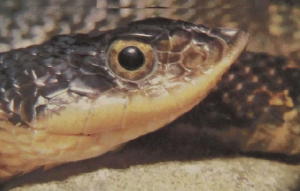 All such snakes feed almost exclusively on toads and use this pointed ridge and sharp, long teeth to penetrate the sides of their prey. This specialization compensates for the toad’s tendency to inflate itself when attacked: puncturing the “balloon” makes the prey easier to swallow. The snakes also seem to have a detoxifying system allowing them to eat these rather poisonous amphibians. 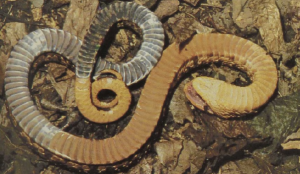 When disturbed, the hog-nosed snake inflates itself or flattens its body; it then hisses, which leads to the erroneous popular name of “spreading adder.” Should this behavior not deter the disturber, the hog-nosed snake will continue the bluff by rolling over onto its back, displaying the whitish belly scales. When such a “death-feigning” snake is righted, it immediately rolls back into the “proper” position of a dead snake. The Eastern Hog-nosed Snake, up to 4 feet long, is found in the eastern and central United States west to South Dakota and Texas.